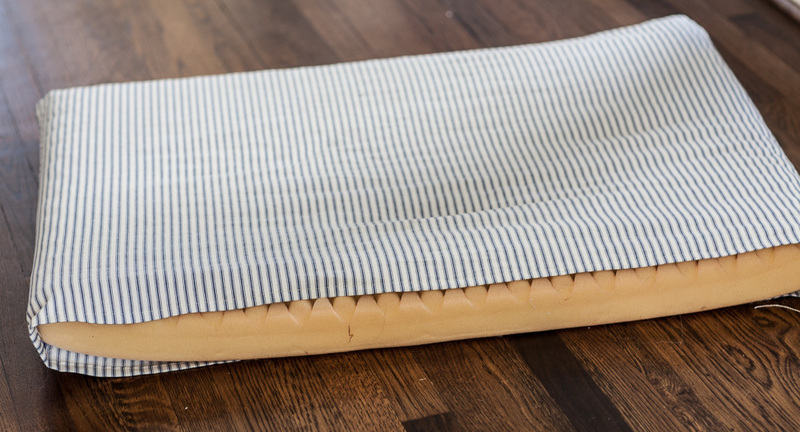 Our Molly the Collie needed a new cover for her dog bed. Of course I couldn’t find anything I liked. I love those DIY dog beds that are made from a drawer, but our Molly is large and so she needed a big bed. I decided to recover the bed she had. As I removed the old cover, I realized the bed was foam. So I used one piece of mattress ticking fabric. 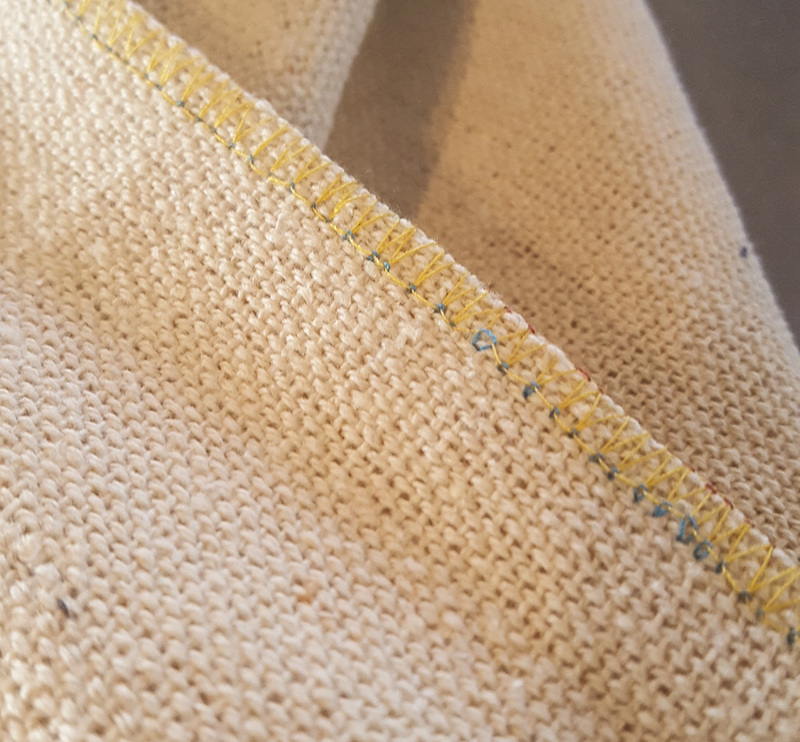 I folded it over and sewed the ends, and hemmed the opening. Yes it is open on one end, but that’s okay. 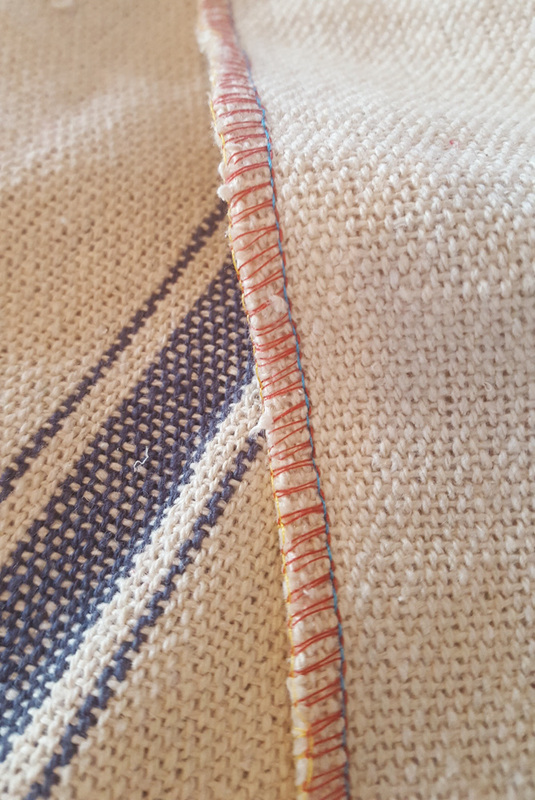 I made another cover almost exactly the same from reproduction grainsack fabric. 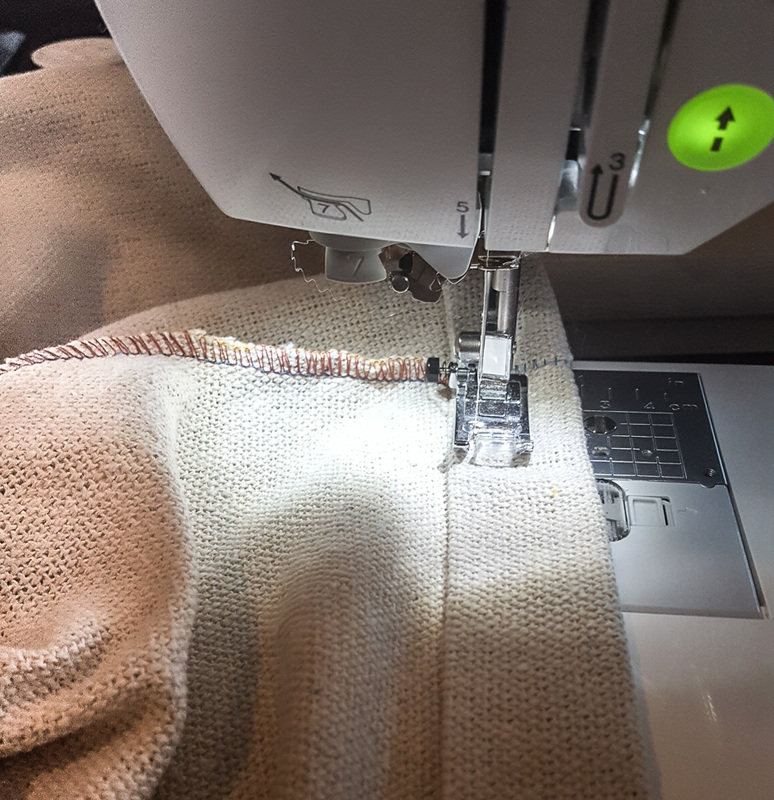 I had purchased a serger sewing machine in December, a Christmas present to myself, but I never had time to figure out how to use it. I just decided to sit down and figure it out. It’s complicated! There are 4 threads and 2 needles. But look at what it does! And it cut the excess fabric all at the same time. This is the other sid of the fabric. I finished off the opening the same as with the first bed cover. I folded over the ends once, pressed them, then folded them over again, pressed them, then sewed the hem. I added 3 sets of ties where the stripes are. I put this cover on the opposite way. It fits very snuggly. This is how the finished end looks. I think it’s very charming. Aww there she is. I asked her to model the bed for you, and she did. Those eyes are so expressive. She’s so attentive and watches my face so closely. Well I think this fabric will be cooler for the summer. Start to finish I think this took about an hour, maybe two. I used about 2 yards of fabric for each cover. And I have one more photo because she’s so cute. This is a very easy project and doesn’t require a lot of skill. You do not need a serger to make this. You could use a regular sewing machine. I LOVE the dog bed and was actually about to make a new cover also! Great idea. Also, I’m obsessed with your rug in the last pic. Can you tell me where to get one? Thanks from Ballard Designs, discontinued I’m afraid. Love it and her! My little Maltese sleeps just like that most of the time. Great dog bed. I made mine with ticking also. Mollie looks like she may have some grey hound in her. lol. Good roach Mollie. My greyhounds do it all the time. Naww.. Molly is just content and happy when they sleep like that. The bed is awesome. I got a serger at a yard sale and could NOT figure out how to use it. Sold it to someone who did. What kind of machine did you buy? They sure are nice to have around I’msure. Love the bed! 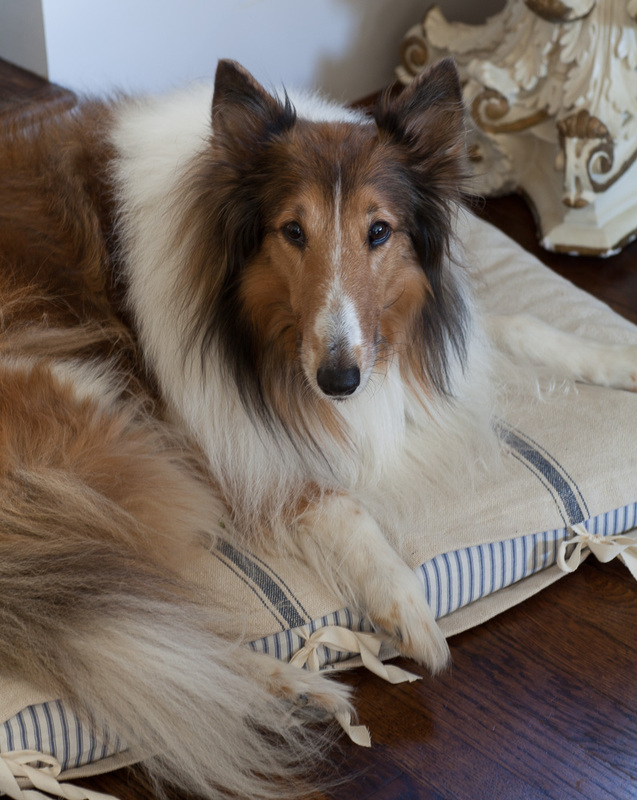 Molly is a beauty – I have a Sheltie, who has Collie features, only smaller – such sweet faces! 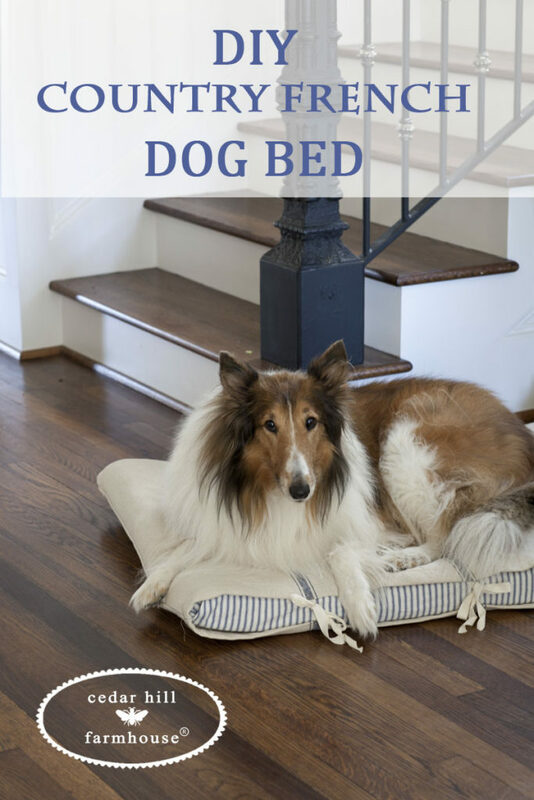 Such a great idea to coordinate with decor rather than be the “dog bed in the room” that you try to ignore. My white Lab Lucy would love this! Love the idea that both undercover and outer cover are removable for cleaning. Awesome Molly bed! 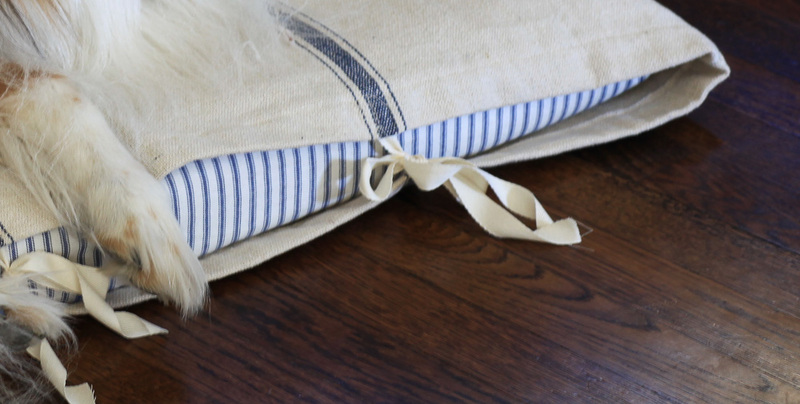 Feel like I’ve made hundreds of dog bed covers however, since I “love” your version and the peek a boo ticking our new rescue is soon to have one! Thank you and many Blessings. I love this!! Sooo good. I don’t think I could figure out that sewing machine, but it looks awesome! Whenever you post a photo of Molly it makes me miss my girl who looked very much like her. Purebred collies are lovely family dogs. 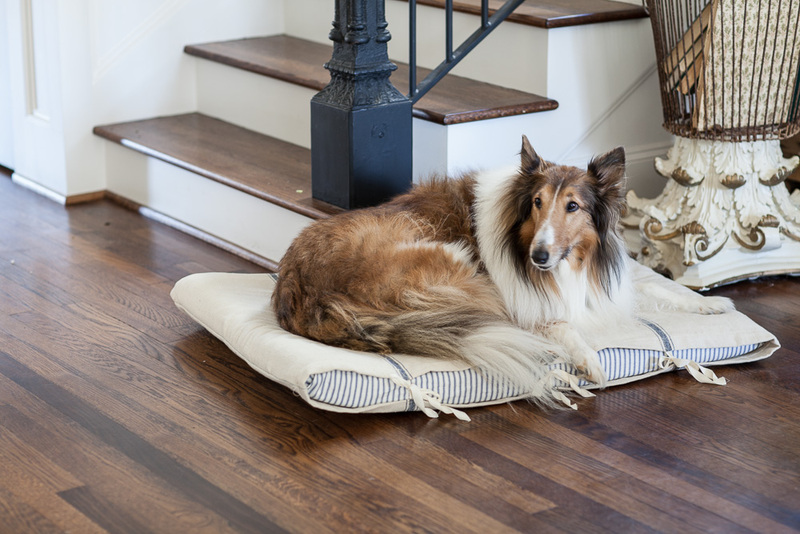 Your dog bed cover is beautiful! Love Molly the Collie! The bed is very nice too! Love Molly’s bed and she is a beautiful dog! Your posts are always so inspiring! Thank you so much for this idea. Love it!. Plan to get a Golden and it will be perfect. This dog bed cover is just awesome. I find this article very helpful. It’s so great to have this. It has a great design that will complement every interior décor. 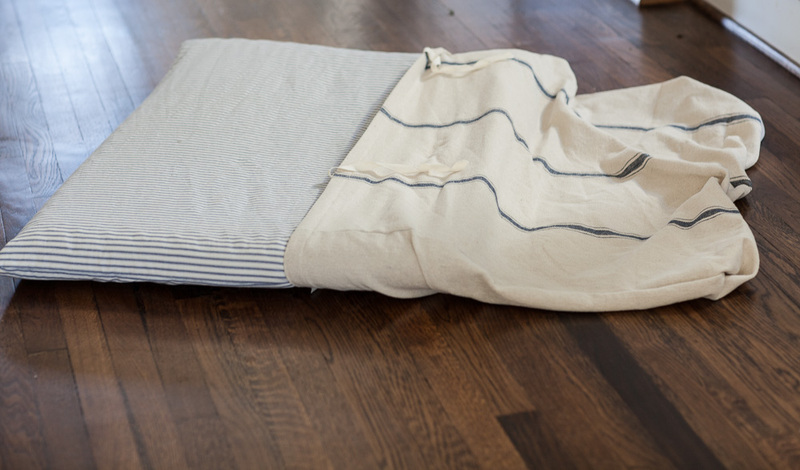 It’s good to do your covers by yourself so it will be cheap and your dog will like it.